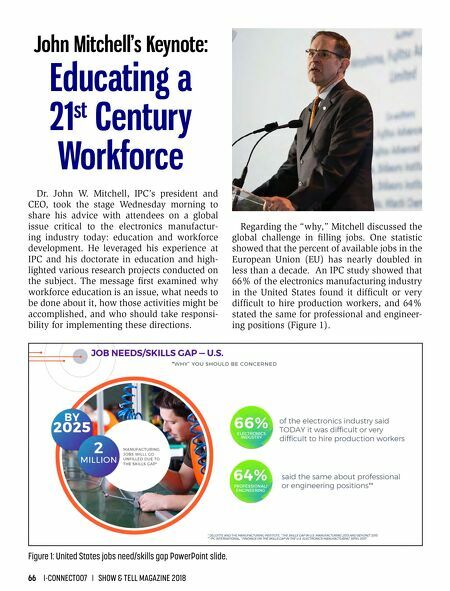 66 I-CONNECT007 I SHOW & TELL MAGAZINE 2018 John Mitchell's Keynote: Educating a 21 st Century Workforce Dr. John W. Mitchell, IPC's president and CEO, took the stage Wednesday morning to share his advice with attendees on a global issue critical to the electronics manufactur- ing industry today: education and workforce development. He leveraged his experience at IPC and his doctorate in education and high- lighted various research projects conducted on the subject. 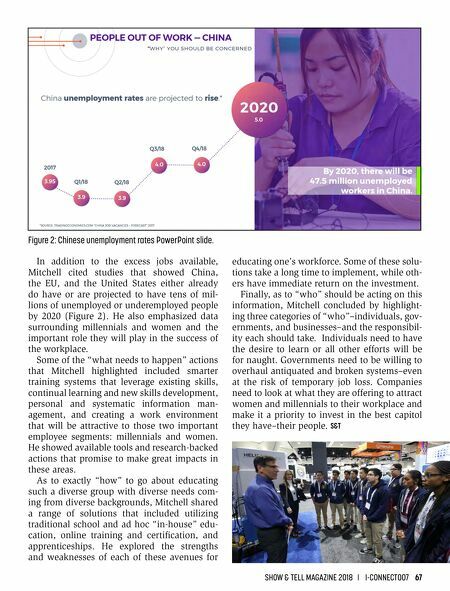 The message first examined why workforce education is an issue, what needs to be done about it, how those activities might be accomplished, and who should take responsi- bility for implementing these directions. Regarding the "why," Mitchell discussed the global challenge in filling jobs. One statistic showed that the percent of available jobs in the European Union (EU) has nearly doubled in less than a decade. An IPC study showed that 66% of the electronics manufacturing industry in the United States found it difficult or very difficult to hire production workers, and 64% stated the same for professional and engineer- ing positions (Figure 1). Figure 1: United States jobs need/skills gap PowerPoint slide. IPC APEX EXPO 2018 is on the Books! IPC APEX EXPO Attendees Speak!